Angashetty Halli village , Areleri Panchayat, Malur taluk, Kolar Dist. 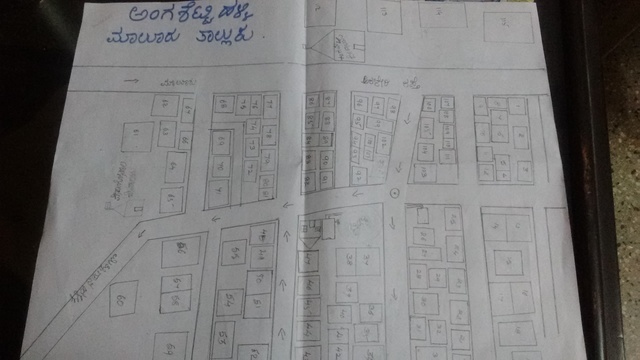 Angashettyhalli is 5 km from Malur town.This small village has 91HH of 750 populations. The villages is surrounded by the eucalyptus trees and small patches of agricultural land where vegetables as main crops. The project have selected 80 HH for the intervention programme where in first stage 40 house holds will be covered for both rainwater and toilet construction. the beneficiaries will be 40 household family members where covering approximately 400 members. The community is basically Agricultural laborers and construction workers community migrates to the other villages and around the district. The community here is scheduled tribes and schedule caste known as Valmiki community. Their major source of income is through agricultural labor, migrating for construction work to cities and other villages, working in brick kiln factories which surrounds the area. There is lower primary school of school strength of 40 children and 40 children in and Anganwadi.Children are often under the care of older folks or on their own. The drinking water facility is through the government dig bore well up to (1500ft) and recently a septic tank inside the village premises where bore well water is pumped into. The present water Quality is not portable. The water stored for two to three days raises smell/odour and high content of flurried. The case of bone related diseases are visible and high. Alcohol among men and women is common, and women tend to take the family responsibilities as the practice of polygamy exists. Children suffer from the malnutrition, irregular to school and youths are almost childlabourres, after lower primary education the children discontinues specially girl child because of early marriage practice. Youths travel with their parents to other villages for work and most them are addicted to alcohol, smoking and panparang.The cases of child malnutrition, childmarraiges and water related diseases are high. Health status of the women and specially adolescents are in stake. The practices of personal hygiene, girl child marriages and giving birth in young age have resulted in poor health condition of the women as well as children. The average family consists of 6-11 members. The community out of 91 HH 10HH has toilets 2 toilets is of grampanchayat member of the village and other 6 toilets built by individual families themselves. 40 families of 400 population will be benefited from the project. The family members including men,women and youths will be undergoing awareness and skill development training programme. 2 members from each families will participate. the families who have ages and children will hire the trained people to get the work done at their house premises. Hygiene education, health check up camps for women and children, capacity building and training s for masons, employment in same village to build toilets, approximately for 100 people. Later these trained people also will have job opportunity to work in near by town and villages. •	Collect water from the rooftop. •	Draw it down from pipes. •	Store in a sump or tank for later use. •	Charge the groundwater through a soak pit. •	Lead the water into a well to increase ground water content. The foundation will derived support from various experts and organizations who have already implemented similar projects in rural area to ascertain the quality of the water and implementation of rightful technology to save maximum rainwater,storage and recharge ground water in the area. The toilet structure is called pukka toilets with 3 pit rings, bricks and sand, cement with PVC doors and ceramic sanitary ware, and ventilation. The structure will be built by community themselves at their door premises after mason training. The door alone is fitted by the supplier. The individual toilets and rainwater harvesting structure will be provided on need based and their participation. And same households will also receive water harvesting structures. The project stages consist of 10 units per phase. Aa foundation has been continued to work with the governments and networking with the departments. The sanitation and rainwater harvesting programme is also supported by interested community based other trusts and IT companies teams to meet the needy community. Providing job at village’s level to construct individual toilets and rainwater harvesting structures. Health session to the community. Thou under Swatch Bharath Abhiyan the sanitation prg has budget for rural house hold, due to lack of awareness and lack of implementation techniques it has not reached the village community. Similarly for rainwater harvesting the lack of awareness and ignorance in maintaining natural water bodies such as ponds, wells and community water tanks has led to shortage of portable water or no water in the area. This particular stretch of our implementation areas has 90HH which has less than 10 toilets. The Rainwater harvesting and Toilet structures are constructed at the beneficiaries’ house hold premises, the organization will not have any responsibility of maintenance. The follow-up of home visits and awareness will continue as the AA foundation have long term plans of development work on other issues. 2. a few questions are answered. 1. Can you expand a bit on the RWH design process? I understand that someone with experience from Mysore is helping. It would clarify to know the process by which the design is finalized (and hence the cost). 2. Given the low rainfall in the area, what is the expected use and how many days of water security? 3. Will the structure be used in dry season? This ans may also be related to #1 and to costs. First let me thank you and team for supporting to receive funds through PWX. And thanking All the VMware team who are funding this project. Before getting into design I would like to make few things clear. We are facilitators in field our projects will pay role in motivating, strengthening the community as well as bringing in grampanchayat and other networking members during implementation to make the programme sustainable. It is difficult to budget for individual house hold RWH for the implementer as well as donor as 100 HH has 100 types of needs, So we have calculated for 20/20 width roof top , 1000ltrs capacity of water tank, a soak pit and training of community members . Now Grampanchayat have pitched in and given the information that individual HH have 36000INR, so community can apply for the funds once the structure is completed. we are not gaurentor for this. Our design ideas are from Rotary rainwater club. And may change according to our field requirement. Aafoundation have identified experts who will be guiding us and conducting community training in future. Our first Training session on RWH is scheduled on 18th and 19th April 2016 at Angashetty halli. content of this will be orientation ,interaction and one module making programme ,Mr Ramesh will be handling the session , expecting Mr Bapuji to join. June -August and September end to December they had good rainfall last year and we are expecting same this year. we can assure 4-5 months usage of rainwater. More importance will be retaining rainwater /ground water through soak pit. Aafoundation will have rich experience , expertise in project implementation process. and we are sure the repel effect among community to implement RWH which is their highest priority. we are with the right partners "PWX" who will be guiding and supporting us for valuable documentation. First Thank you and team for supporting to receive funds through network. and All thanks for the VMWare Team who is supporting this cause. Before getting it to design I would like to give some background of the project view. Aa foundation plays a role of facilitator in the field, our major concern is to strengthen & motivate community towards the environment programme either it is sanitation or RWH. Specially RWH budgeting for individual HH is difficult and budgeting to institutions is easy. reason is hundred house hold has hundred type of need, it is difficult for implementer as well as donor. The Aa foundation have identified experts who has been consulted and will be part of the programme in training and motivating the community. Also I would like to share our role will be bringing in experts , making grampanchayat to participate and making community as decision makers towards implementation of the programme so the funding we have applied is sufficient to do this. Community will be having freedom to decide the tank requirement, size they will meet the extra cost at their household premises. Now Grampanchayat have pitched in and saying they have 36000INR for individual RWH. So community after completion can apply for the GP funds. But we are not garenter for this. Please find the persons identified by the foundation who will be guiding and supporting for the community training programme in future. The first community training programme is scheduled at Angasettyhalli on 18th and 19th April 2016. The two days training consists of theory,interaction and module making( one). Prior to this from April 1st 2016 survey of individual house hold is starting. 1. What is the possibility of introducing dry toilets (dual-pit ecosan)? Even for a few of the families? 2. Has there been any effort to study the difference between this and dual pit? Is this single pit based on cost or there is virtually no benefit? We did try to educate community in our 2013-1014 sanitation awareness programme specially after our field visit to Tamilnadu villipurum project.we found our community didn't welcome the dry toilet ideas, still I strongly feel we should have our few community members to visit the TamilNadu project to make them understand as all of them are basically farmer have patch of land of their own and this method will help them to fertilize the soil. sure this time five community members from 2-3 villages can visit. we are open for experiment this in small scale. single pit or double pit as a head of the programme I need more clarity. looking forward for more information. now we are implementing single pit toilets one is the cost other is we think another 10-15 years the single pit won't fillup in dry land of kolar as in urban area bangalore we have this experience . Looking forward more information from PWX who has diversified partners and experience to assist us. First session on sanitation is s scheduled on 5th April 2016 . Mr Prahalad from SOCHARA and myself will be handling session and planning first phase of implementation with the community.